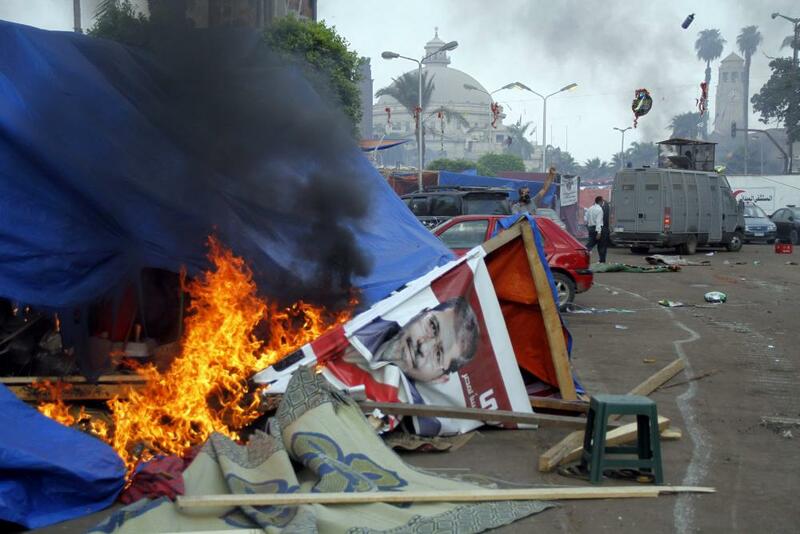 Over the past week, the civil unrest in Egypt has taken a turn for the worst, developing into extreme violence. While the exact death toll is unknown, reports estimate that approximately 800 protesters have been killed and many more injured in the last week alone. Videos and reports from the conflict show Muslim Brotherhood members and the military personnel engaging in open gun-battles in the street; in addition to these battles, the military has fired upon completely unarmed protesters—including first responders, reporters, and obvious non-combatants—and the Muslim Brotherhood has targeted the Egyptian Christian population under the assumption that they side with the military. 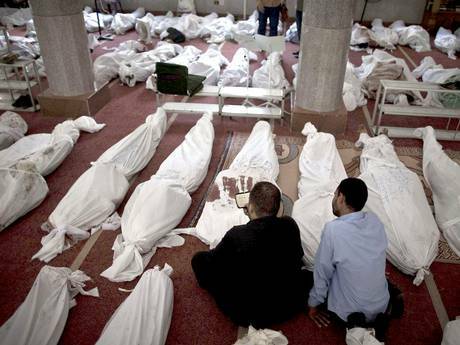 Personally, I have great sympathy for the Egyptian people and think that something needs to be done to stop this crisis immediately. Even if one disagrees with the Muslim Brotherhood in virtually every issue (as I do), they have the right to protest without fear of facing a firing squad in the streets. That said, the exact course of action that needs to be taken remains to be seen, as the very nature of this conflict makes choosing a good solution extremely difficult. The situation is Egypt is incredibly tragic, but it is also unbelievable complicated: The Muslim Brotherhood won power democratically, but they started to pass theocratic and undemocratic legislation, so the military performed a coup—this coup was supported by many Egyptians, but it also was incredibly anti-democratic and resulted in massive protests. This situation was further complicated when the Muslim Brotherhood started to become violent in their protests and the military began shooting indiscriminately against unarmed protestors. On one side, we have theocrats who won an election but who abused their power once in office being shot in the street and engaging in anti-Christian terrorism. On the other side, we have the military killing people indiscriminately in the aftermath of a coup (and yes, regardless of the word-games being played by the American government, that is what it was) which initially heralded great public support. It is untenable for us to support the military while they shoot innocent people for exercising their rights. That said, their coup against the Muslim Brotherhood was not necessarily a bad thing, as the Morsi government was consolidating power in an attempt to subjugate Egypt under Islamic law and make it almost impossible to vote them out of power (against the will of the Egyptian people). In my opinion, the best (but still imperfect) solution to this situation is for the Egyptian military to stop all violent opposition to protests and announce new elections, including a larger variety of candidates than were given during the election which Morsi was elected, and in far enough in the future to give all parties the ability to organize. This solution would ease pressure on all sides, as it would give the Muslim Brotherhood the ability to confirm Morsi as president through peaceful means while giving the rest of the population the ability to vote Morsi out now that they know what he intends for the country. In addition to easing pressure and mitigating violence in Egypt, this solution would allow the Egyptian people to make a more free and informed choice in their governance. The election which elected Morsi was relatively soon after the toppling of a dictator and the only organized political entity was the Muslim Brotherhood—this gave them a massive advantage and allowed Morsi to beat the other potential candidates. To further compound this advantage, the person who Morsi was running against was Ahmed Mohamed Shafik Zaki—Mubarak’s handpicked Prime Minister before the Egyptian revolution—thus reducing the choices in the election to the theocratic newcomer or a relic of the old regime. Opening this competition to more choices would give the Egyptian people the political equivalent to a mulligan and would ensure that democracy was sustained, even in the face of a coup. Unfortunately, I see no way for the United States to exert any control over this situation without causing more problems than we solve. Any solution which we push on the Egyptians will be considered encroachment by western powers and any taking of sides will likely result in us alienating massive portions of the Egyptian people—if we support the protesting Muslim Brotherhood, we alienate the secular and military demographics of the Egyptian people while, if we support the military, we will alienate the more religious Egyptians and those who have been harmed by the military’s brutal crackdown. The USA must immediately stop giving aid money to Egypt, simply because federal law restricts the USA from giving military aid money to military governments established through a coup. This is the law and, unless it is changed, our government’s hands are tied—the law doesn’t give us an exemption to use if we support the military coup on ideological, strategic, or economic grounds. That said, such a withdrawal of funds is does pose a risk of decreasing our ability to affect the situation through exerting pressure against the Egyptian government. At the end of the day, this situation is difficult because there is no real external solution to be seen. It is possible for foreign powers to exert pressure—the other Muslim countries in the area probably have a better chance of affecting change without blowback than the USA—but the solution will likely have to deal with their conflict internally. Unfortunately, this conflict could easily devolve into a civil war like Syria or a military autocracy (due to an overreaction to the protests and the desire to preserve “order” through any means necessary) before such a solution is worked out between the involved parties. 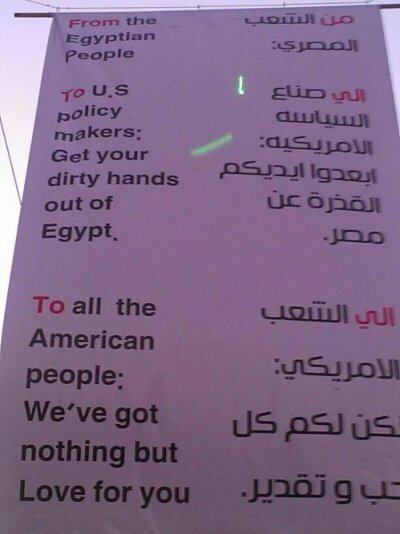 Most cogent observations I have read yet about Egypt. The only additional comments I would make is that if USA quits funding, many other middle east countries will continue. It may not actually true that other countries would follow if the USA pulls out–in fact, several countries (including Saudi Arabia) agreed to continue aid to Egypt and were discussing providing matching funds if the USA were to cancel aid. I don’t know how serious these discussions were, but they were certainly going on and by interests with the economic power to back them up. I concur with restwelll. However, not strong enough on the “USA needs to stay out of its middle eastern meddling”, PERIOD. I agree that we should stop trying to take military action in the Middle East and attempting to play king-maker, we do have a very legitimate role in the region for a diplomatic agenda. The USA can act as an impartial mediator in a way which in not really possible for other countries, thus we should continue in this fashion–I don’t consider that meddling.